Five young area classical instrumentalists have been named winners in the 2016 Pearl & Julius Young Music Competition, sponsored by The Baroque Orchestra of New Jersey. 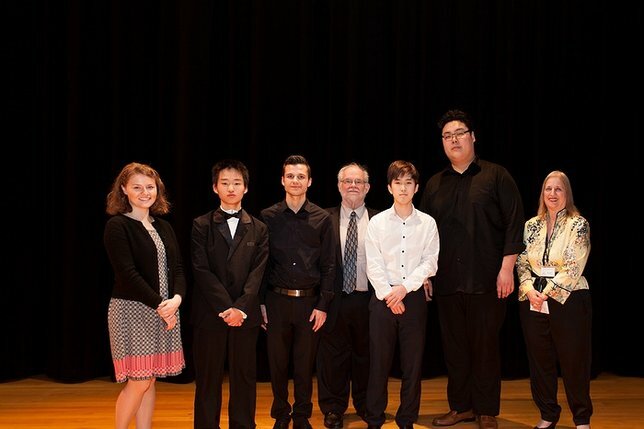 Morristtown, NJ - March 23rd, 2016 - Five young area classical instrumentalists have been named winners in the 2016 Pearl & Julius Young Music Competition, sponsored by The Baroque Orchestra of New Jersey. They are Chase Park, 17, cello, of Englewood Cliffs, who took first prize in the competition,and received a $1,000 award, as well as an opportunity to appear with the Orchestra in its annual Summer Music Festival on August 21 at Dolan Hall, College of Saint Elizabeth, Morristown. For his prize-winning entry, he performed Cello Concerto in C, by Franz Joseph Haydn, which he will also perform at the Summer Music Festival. Second-place winner was Thomas Kurtz, 21, saxophone, of Montclair, who was awarded a $500 prize. He performed Concertino da Camera, Movement 1, by Jacques Ibert. Third-place winner was Ania Filochowska, 21, violin, of Philadelphia, who received a $250 cash award. She performed Violin Concerto, Movement 1, by Pyotr Ilych Tchaikovsky. First Honorable Mention went to Daniel Hamin Go, 19, cello, of New York, NY. He played Variations on a Rococo Theme, by Pyotr Ilych Tchaikovsky. He received a cash award of $100. Second Honorable Mention went to Kenta Nomura, 16, violin, of Westbury, NY. He played Violin Concerto, Movement 1, by Jean Sibelius. He also received a $100 cash award. The Young Music Competition, held annually since 2008, is supported by Stephen and Sanford Young in memory of their parents, Pearl and Julius Young who, although not musicians themselves, were committed to mentoring young artists. Lisa Young, Esq., a member of the Orchestra’s Board of Directors, was chairperson for the competition. Judges for the competition were classical guitarist Stanley Alexandrowicz of Princeton; cellist Evan Ardelle of Ridgewood, and a member of The Baroque Orchestra of New Jersey’s Board; and Andrew Pecota, principal bassoonist of the Orchestra, who is on staff at Montclair State University. Pictured Above: Winners Of The 2016 Pearl & Julius Young Music Competition are shown here after they competed with six other finalists at Dolan Hall, College of Saint Elizabeth, Morristown recently. They are, from the left, Violinist Ania Filochowsa, of Philadelphia, PA, third place; violinist Kenta Nomura, Second Honorable Mention, of Westbury,NY; saxophonist Thomas Kurtz, of Montclair, second place; Dr. Robert W. Butts, conductor and music director, The Baroque Orchestra of New Jersey; cellist Chase Park, of Englewood Cliffs, first place winner; cellist Daniel Hamin Go, of New York, NY, first Honorable Mention; and Lisa Young, Esq., vice president of the Orchestra's Board of Directors and chairperson of the Competition. Subject: LongIsland.com - Your Name sent you Article details of "Westbury Teen Among Five Young Instrumentalists Named Winners in the 2016 Pearl & Julius Young Music Competition"